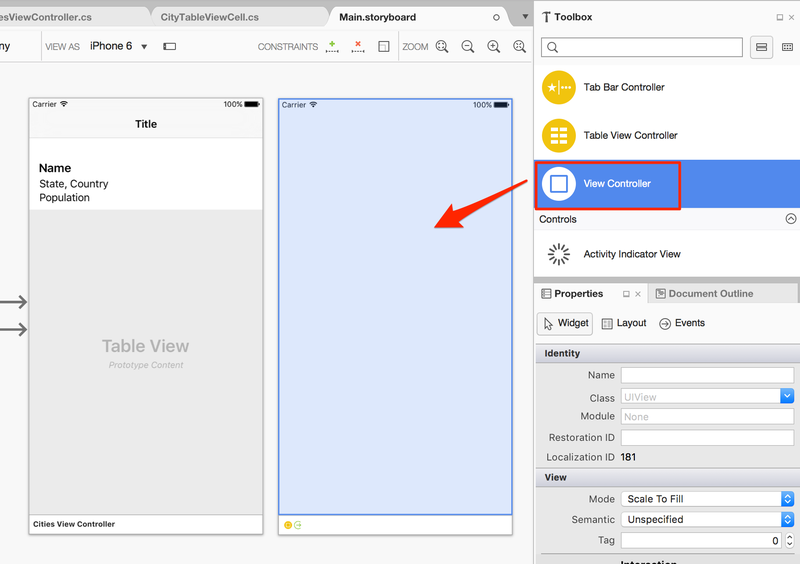 This tutorial will show you how to add and use ToggleButton elements for Android apps in Xamarin. ToggleButtons are like on/off switches that only have two possible states and can only be in one state at any one time. 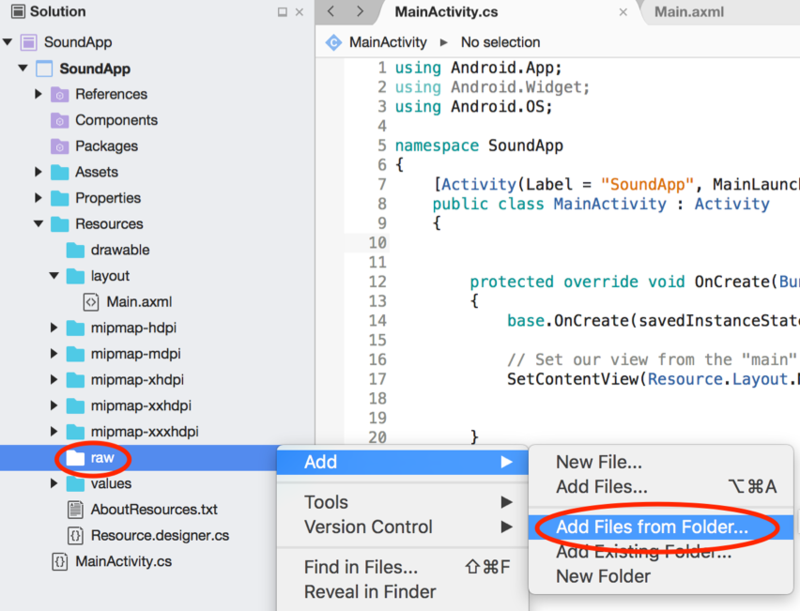 To get started, create an Android app solution in Xamarin and open the Main.axml file from the Resources > layout folder. 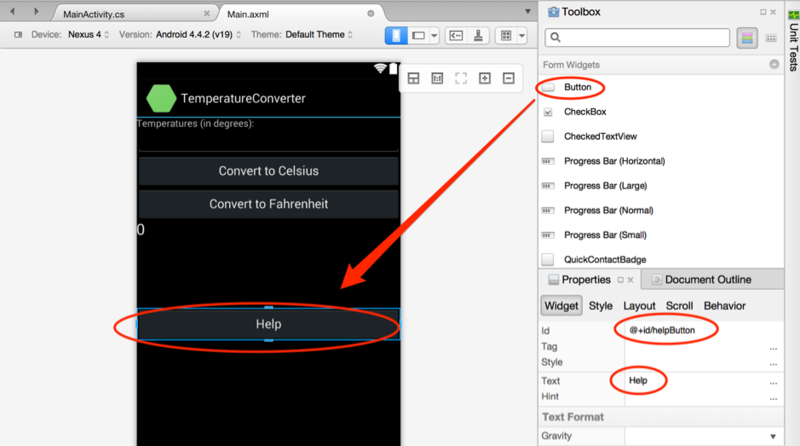 Drag a ToggleButton element on to the screen from the toolbox and give it an Id (eg. @+id/toggleButton1). The default text for a ToggleButton that is on is “ON” and the default text for a ToggleButton that is off is “OFF”. 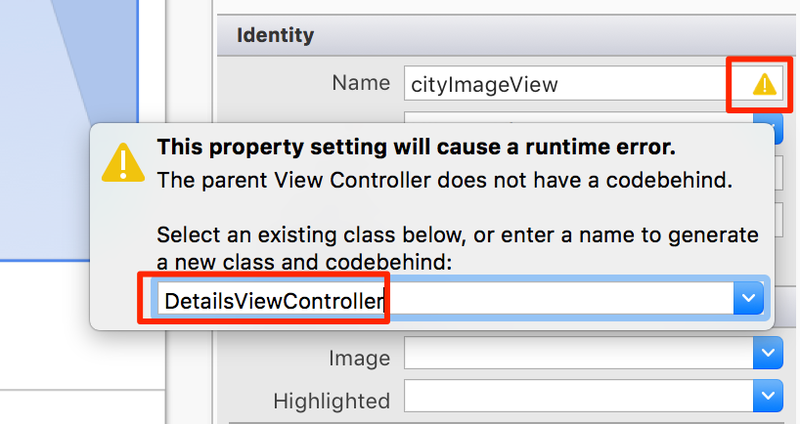 However, you can change this from the Properties panel. 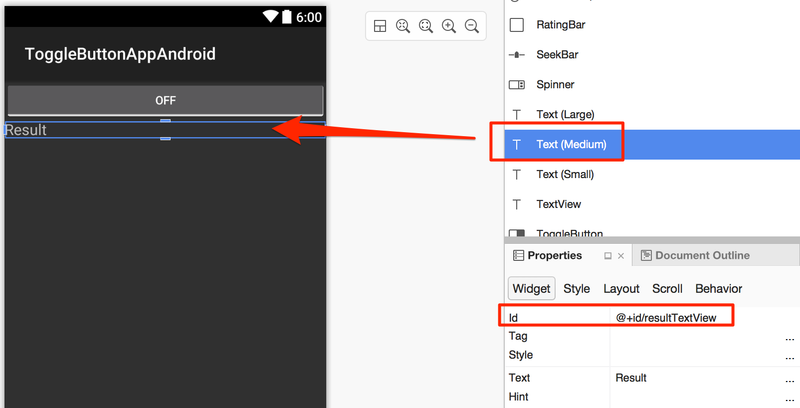 Add a Text (Medium) element to the screen that will display a change in result (eg. ToggleButton switching from off to on). 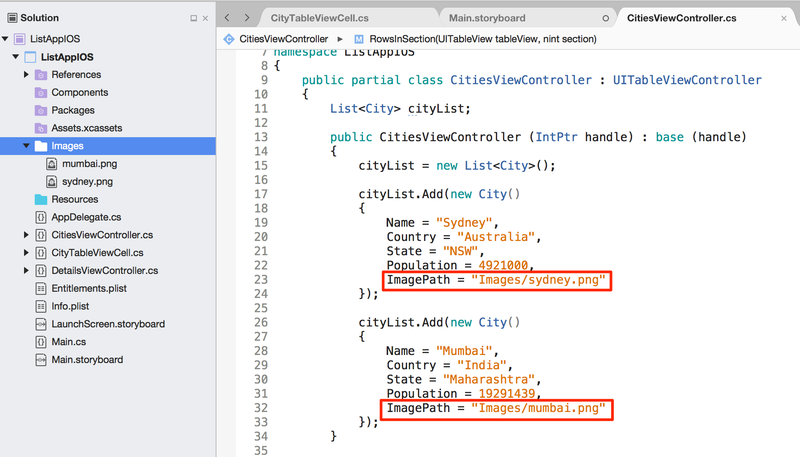 This example TextView is named @+id/resultTextView1. Save the Main.axml file and go to the MainActivity.cs file. 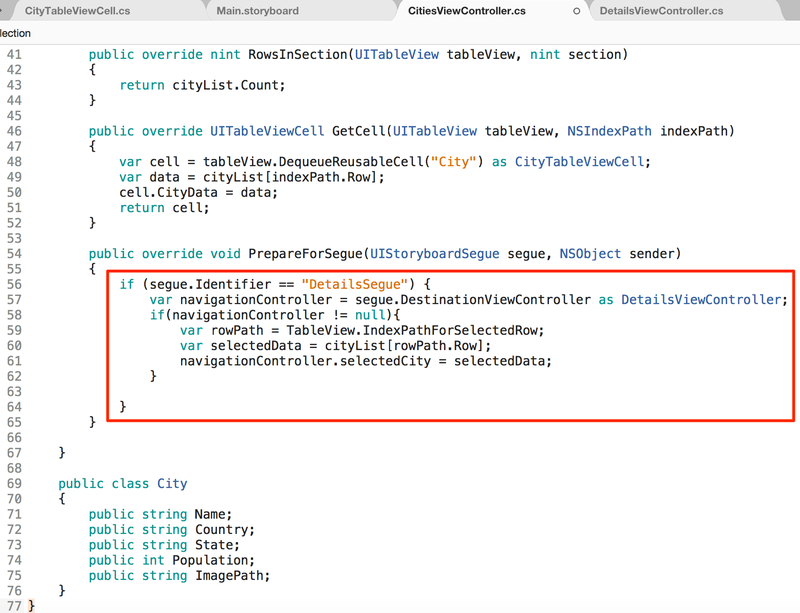 Define and set up the ToggleButton and TextView elements in the code and add a CheckedChange method which checks when a change in state is detected. The if statement will check if the ToggleBox is checked and will display the result. 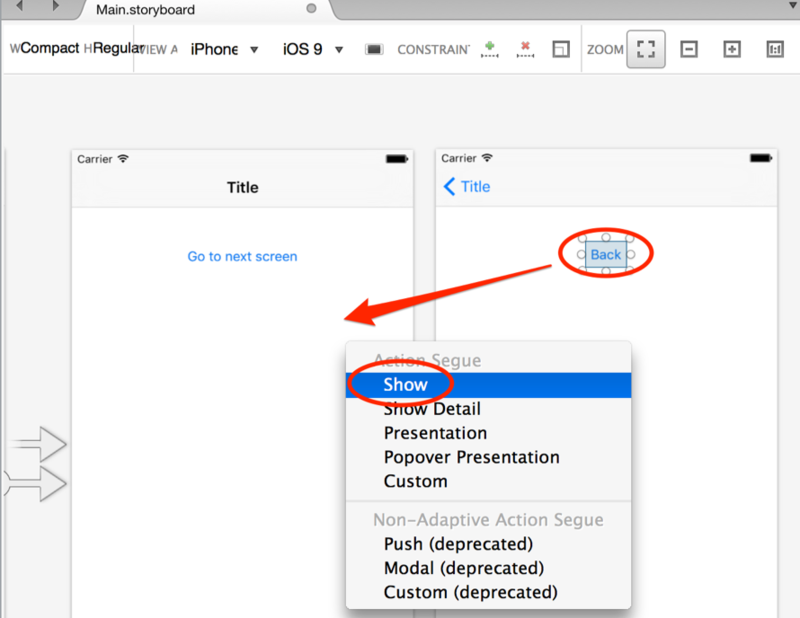 This tutorial explains how to play audio files in the background in an iOS app. An audio file can play when a screen loads or when an event occurs (such as a button press or change in a variable’s value). 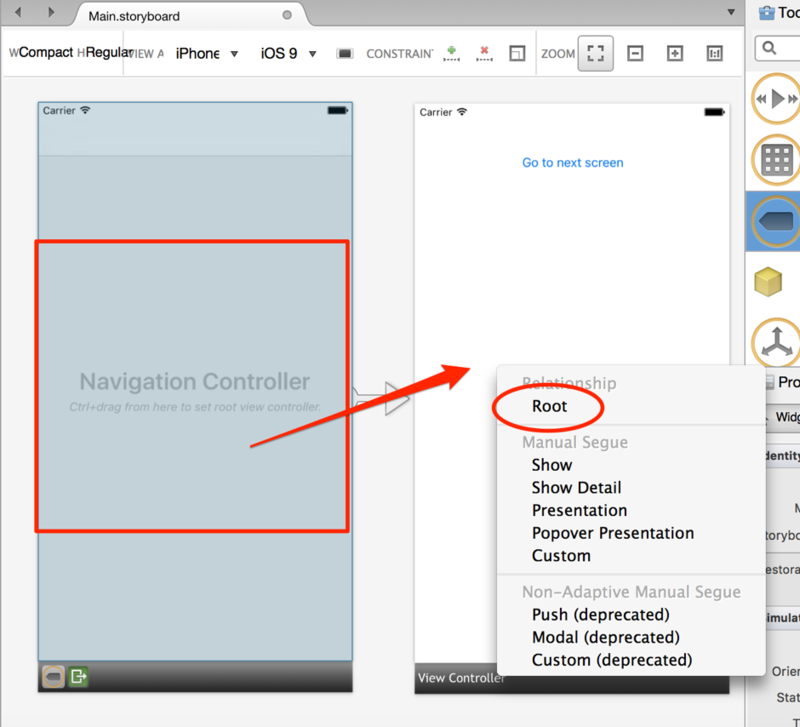 The example app in this tutorial will play a sound when a button is pressed. We will also look at how to use the Vibrate function in an iPhone to make the phone vibrate as well as playing a sound. 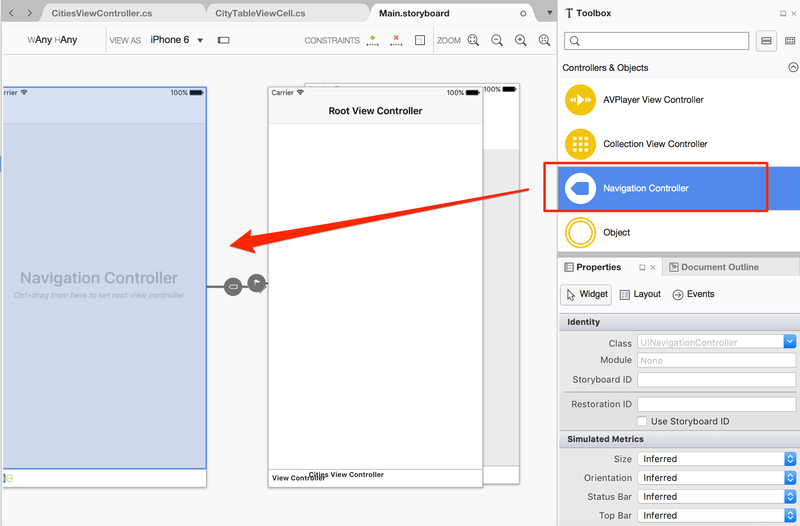 Open Xamarin and click File > New Solution. 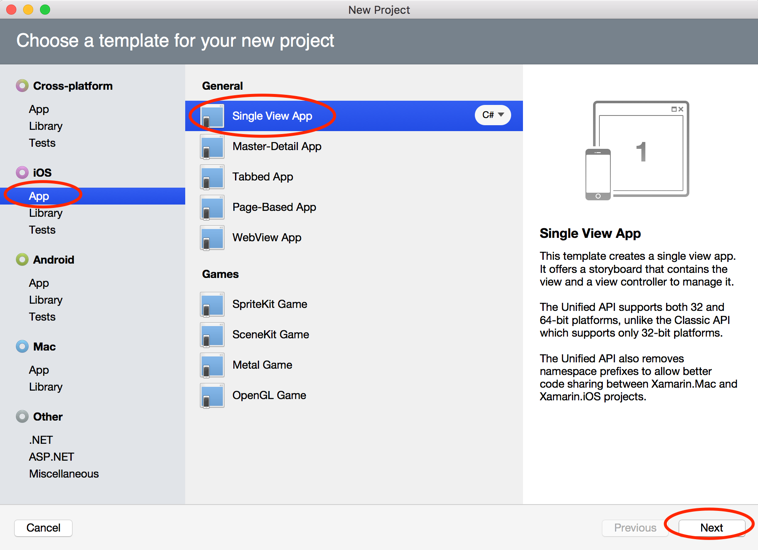 Then select iOS App and SingleView App as the project template. Click Next. 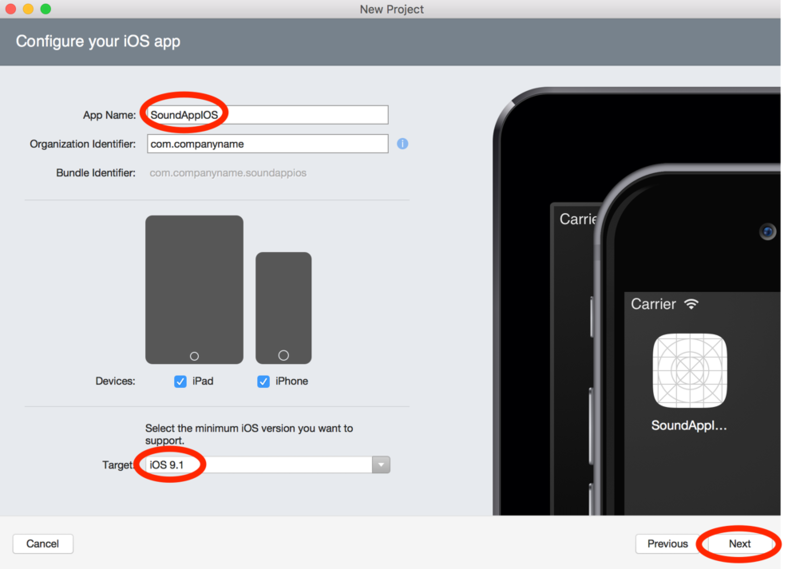 Give your new app a name and select a target iOS version. Click Next. 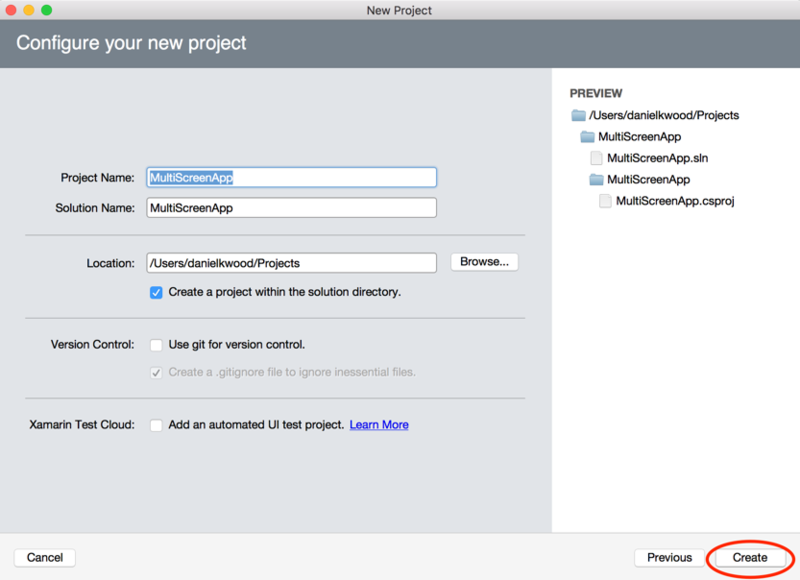 On the following screen, confirm the project and solution name and then click Create. 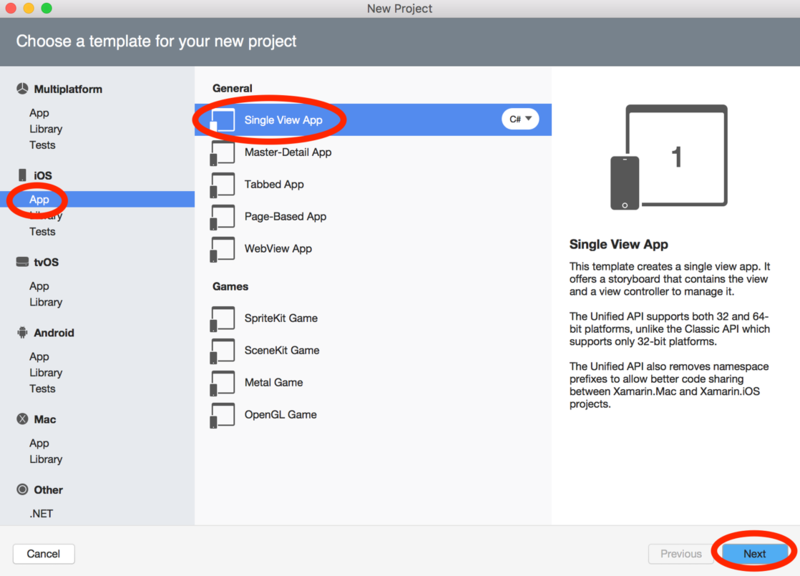 When the solution opens, right-click on the project folder. Select Add > New Folder. Give the new folder the name Sounds. 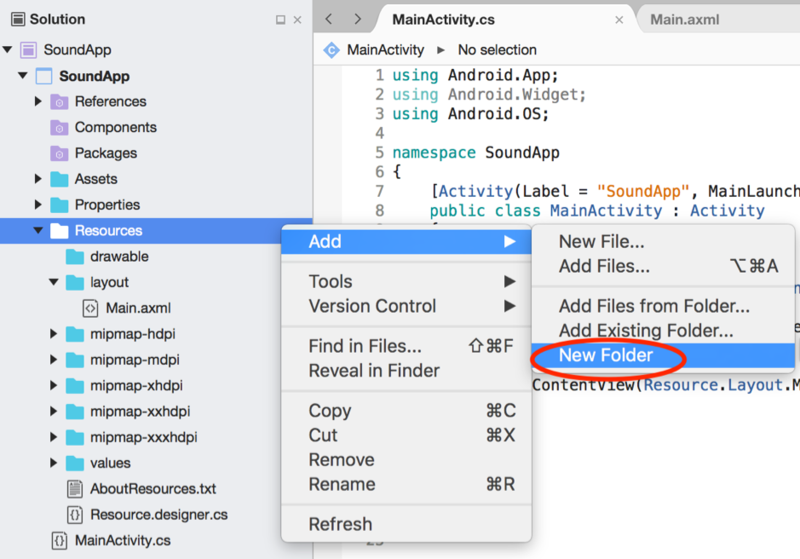 Right-click on the new Sounds folder and select Add > Add files from folder. 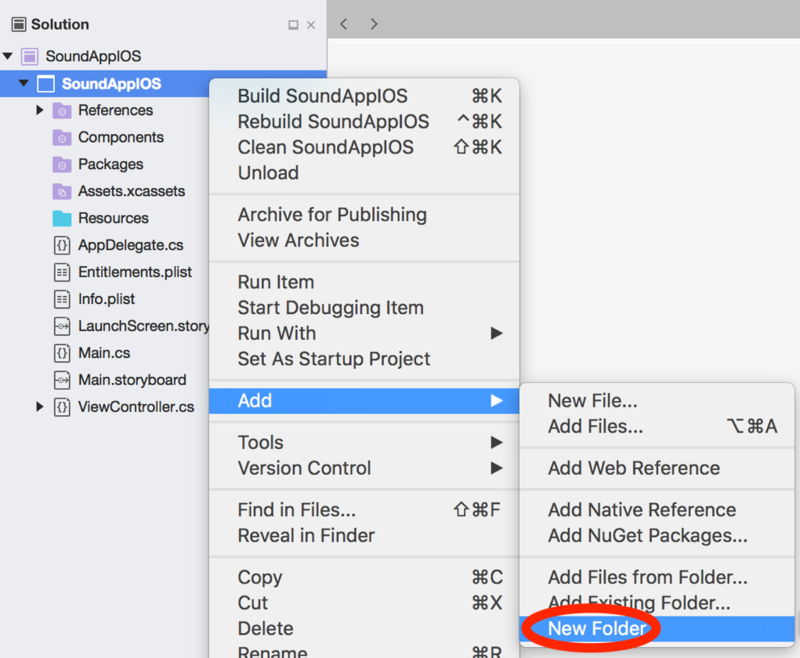 Navigate to the folder which contains the audio file(s) you wish to use in your app. Click Open. 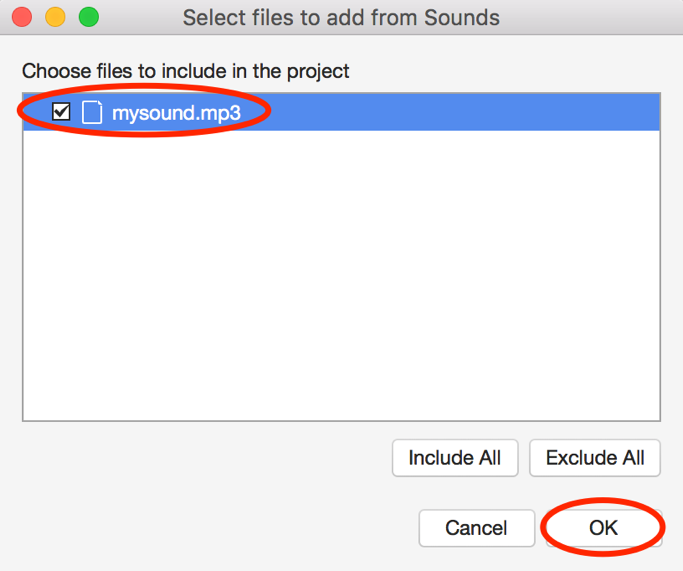 Select the audio files you wish to include in the project (for this example, we will use an MP3 file called mysound.mp3). Click OK.
Then select Copy the file to the directory and click OK. This file will be copied to the project’s Sounds folder. 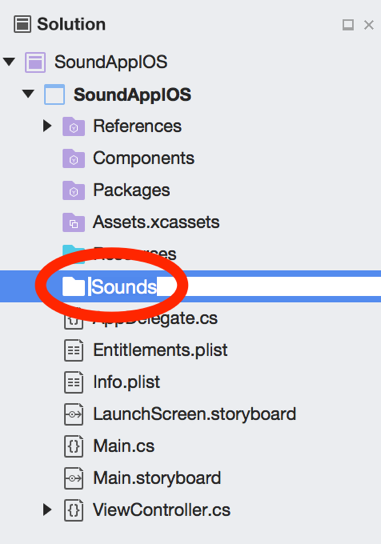 You should then be able to see the audio file in the Sounds folder within the project folder from the Solution panel. Right-click on the audio file in the Sounds folder. 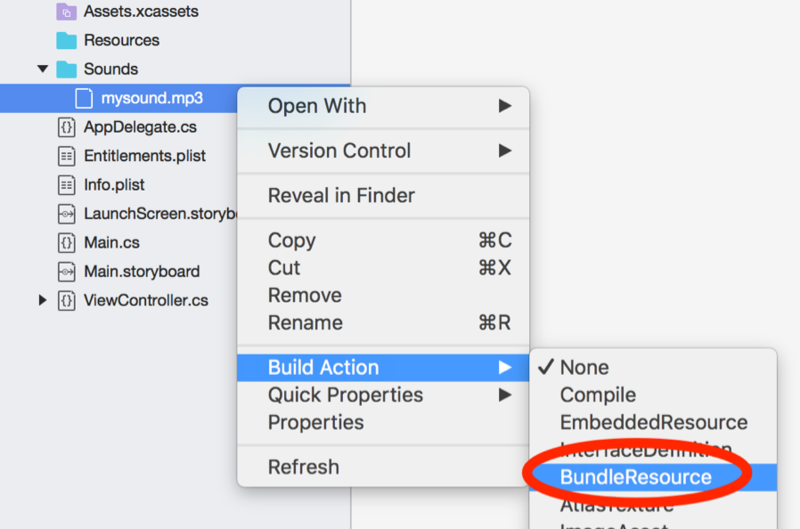 Select Build Action and set to BundleResource (if this does not work during testing, try selecting Content instead). Open the Main.storyboard file. 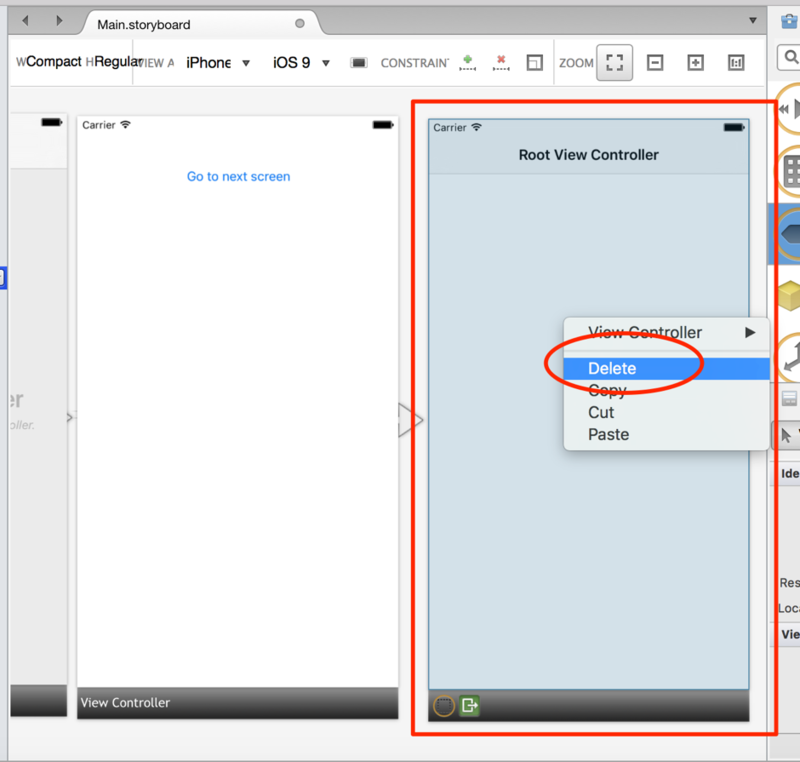 Change the View to your desired iPhone/iPad model. 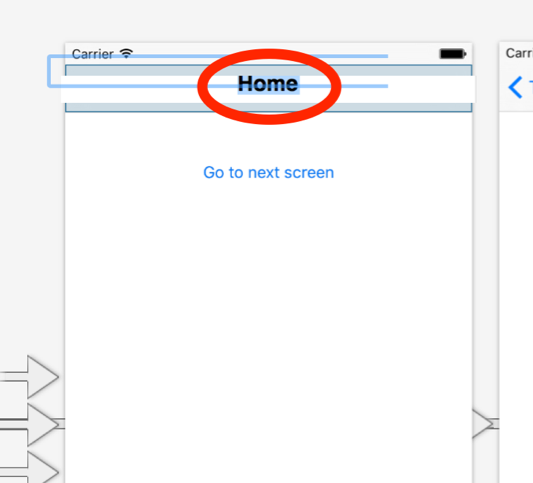 Drag three Button elements on to the screen as shown below. Give the first button a Name of playSoundButton and the text value ‘Play sound’. 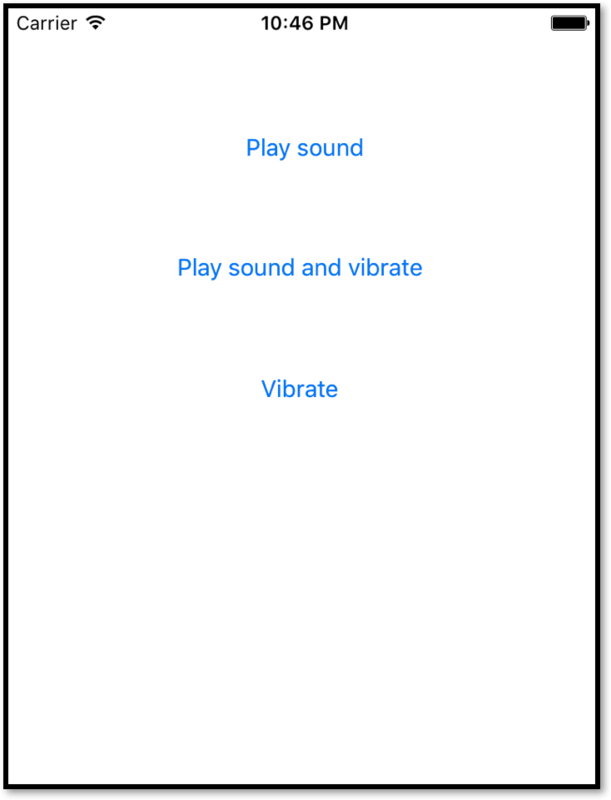 Give the second button a Name of playSoundVibrateButton and the text value ‘Play sound and vibrate’. Give the third button a Name of vibrateButton and the text value ‘Vibrate’. Save the file. 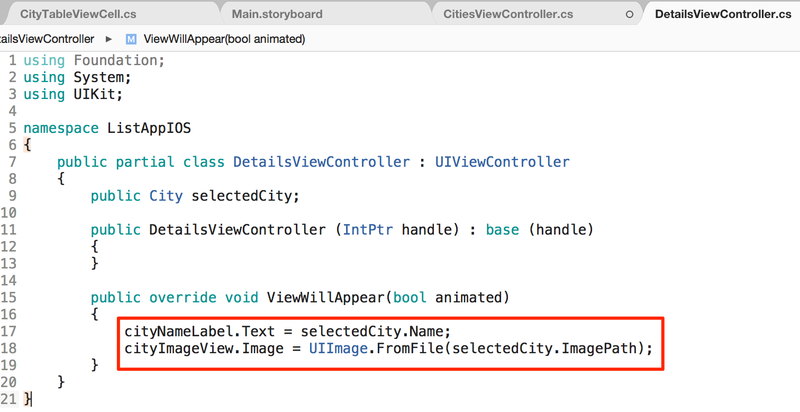 Open the ViewController.cs file and add the following two highlighted lines of code. 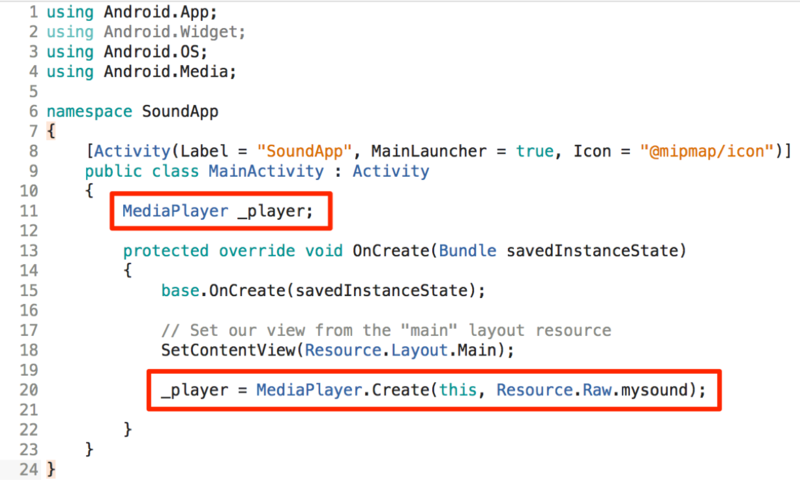 The first two highlighted lines allow us to access audio tools and lower-level classes. url defines where the location and name of the audio file, while mySound is the name of the variable holding the sound file. 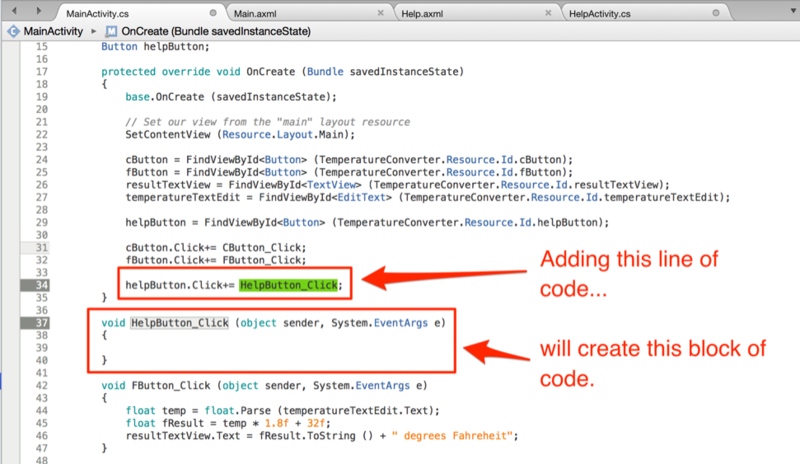 Now add the following two highlighted lines of code in the ViewDidLoad method. Here we define the location and filename of the audio file as well as directing the mySound variable to use this audio file. 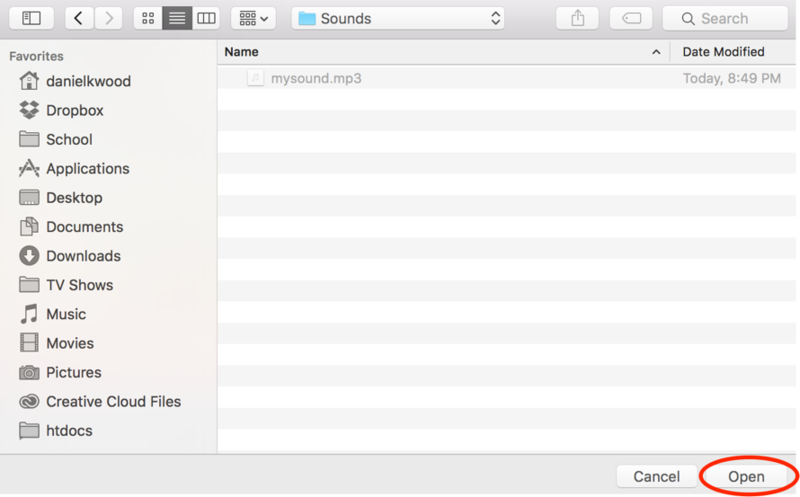 Replace mysound.mp3 with the name of your sound file. 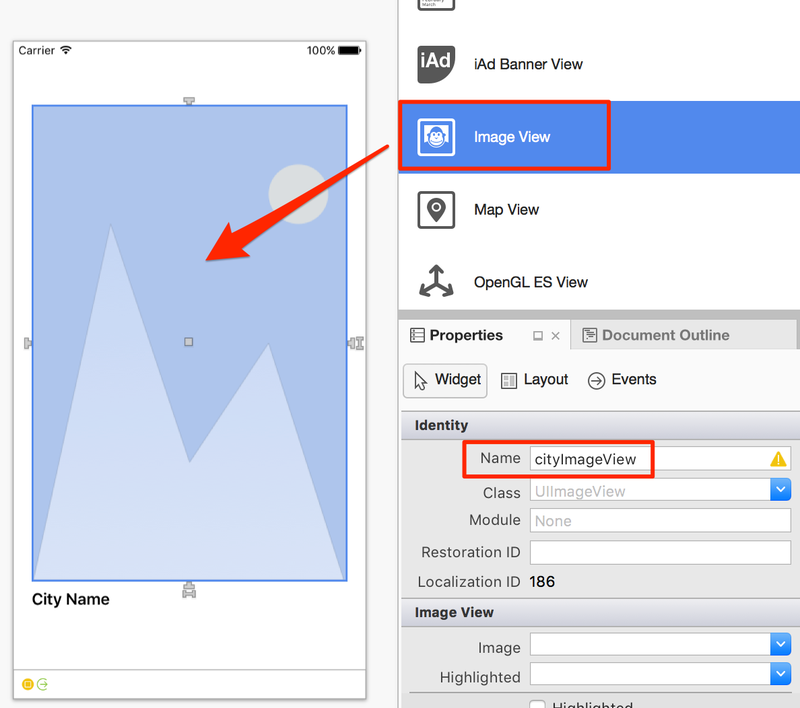 Now create a TouchUpInside event for each of the three buttons in the ViewDidLoad method. 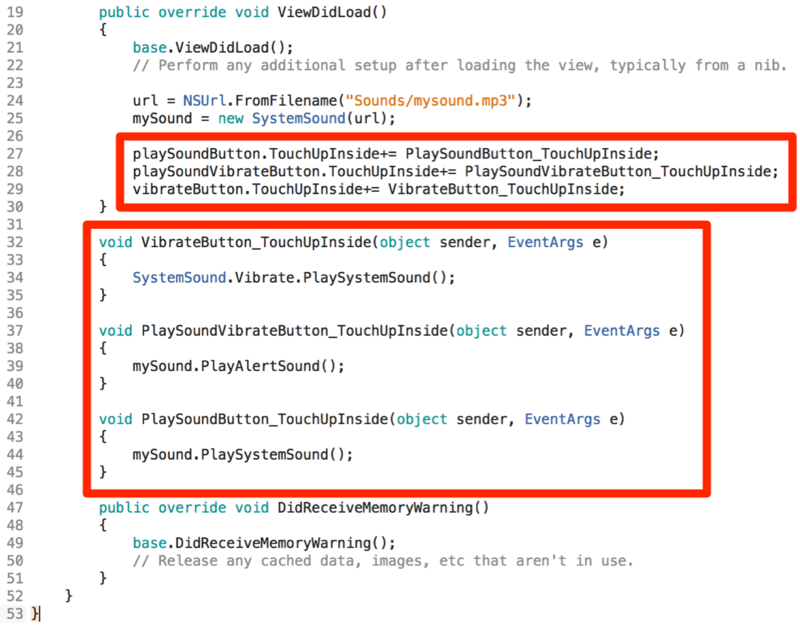 Inside the new methods for each TouchUpInside event, add the lines of code shown below. That’s it! Now go and test the app! 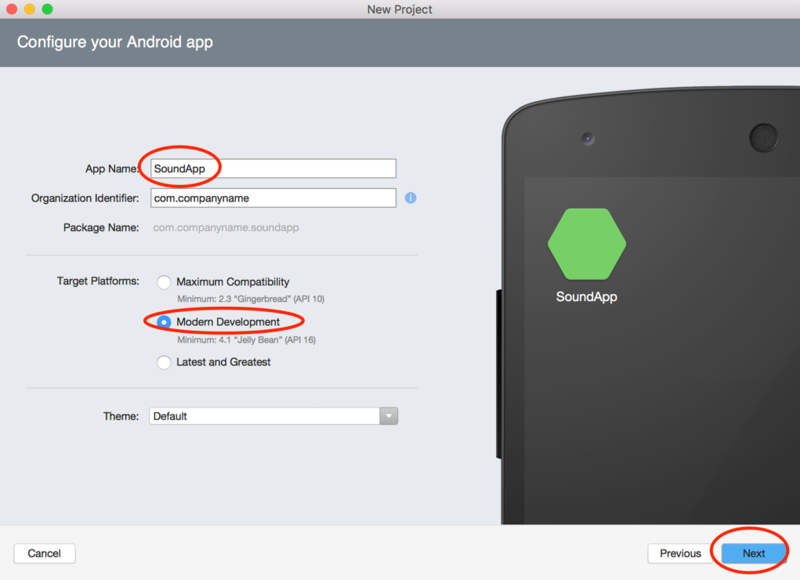 This tutorial explains how to play audio in an Android app made in Xamarin. 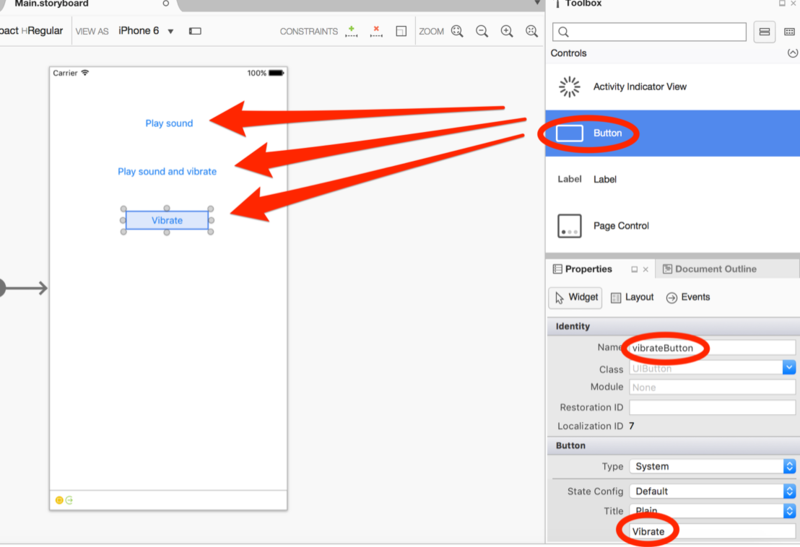 The audio can be played when a screen loads or when an event occurs such as a button click or change in a variable’s value. For this tutorial, we will play a sound when a button is tapped. 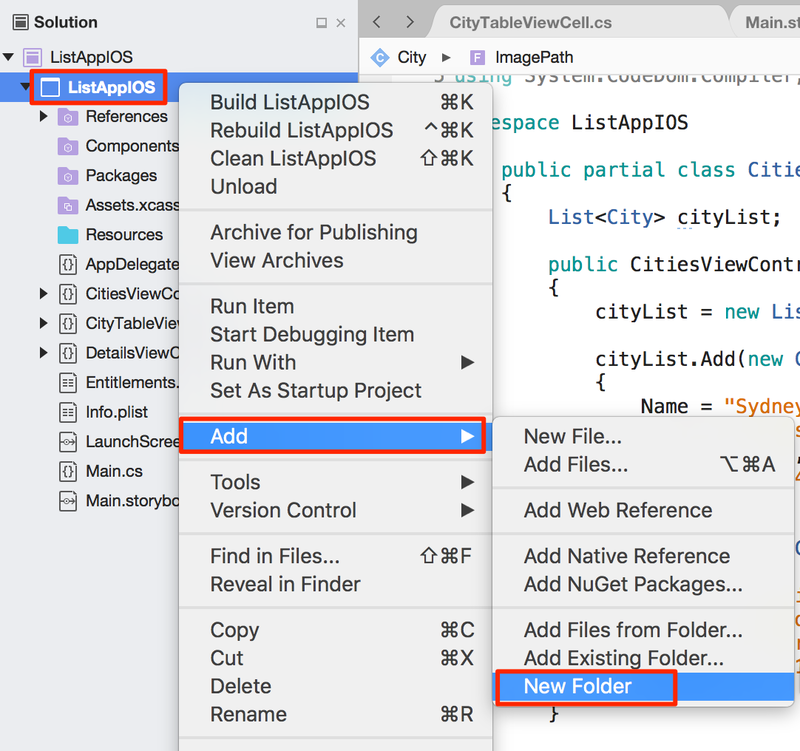 Start by creating a new app solution in Xamarin (click File > New Solution). 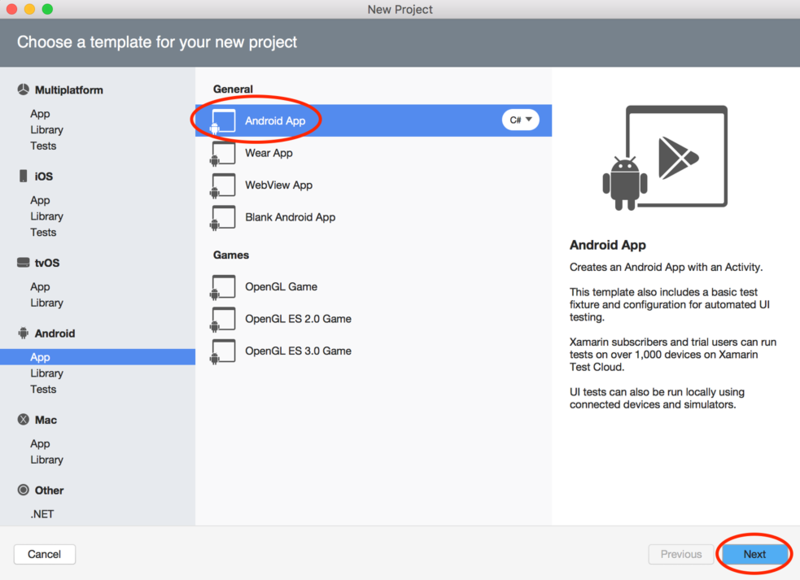 Select Android App as the project template. Click Next. Give the new app a name. Then click Next. 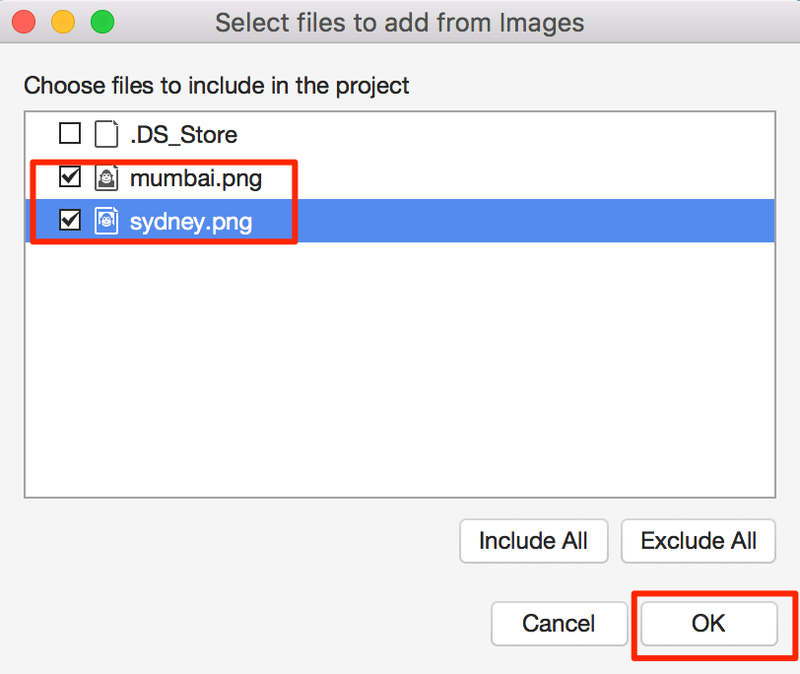 Confirm the solution and project name, Make sure you specify a folder to store your project files in and then click Create. Open the Main.axml file (in Resources > layout). Delete the button already there. Save the file. 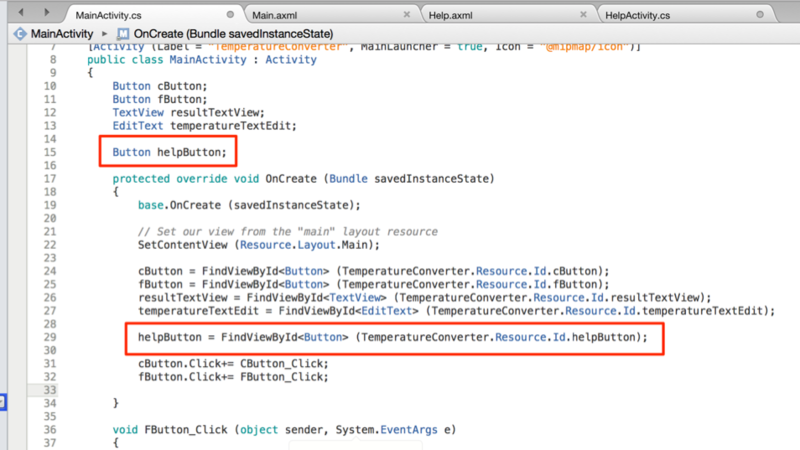 Open the MainActivity.cs file and delete the highlighted lines of code (these lines for the button are not needed anymore as we won’t be using the default button). Right-click on the Resources folder. Select Add > New Folder. 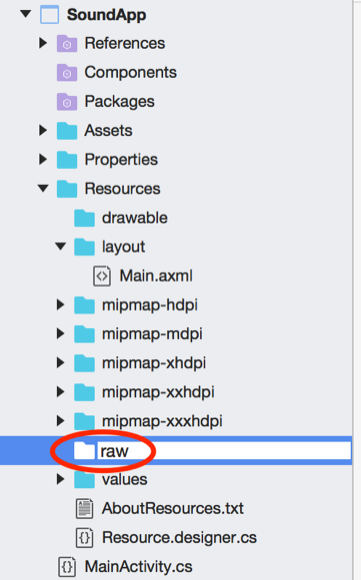 Give the new folder the name ‘raw’ and then press Enter. Select the new ‘raw’ folder and right-click it. Then click Add > Add files from folder. Then select Copy the file to the directory and click OK. This file will be copied to the project’s raw folder. You should then be able to see the audio file in the raw folder from the Solution panel. 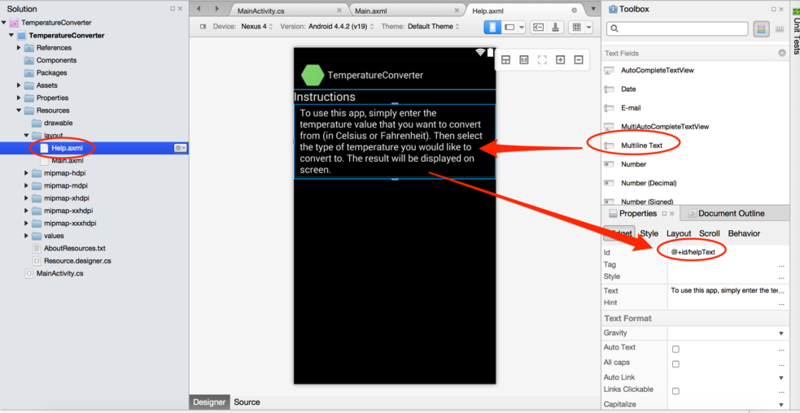 Open the Main.axml file again and drag a Button element from the Toolbox onto the phone screen. Change the button’s Id value to @+id/playButton. Then change its Text value to Play Sound. Save this file. Open the MainActivity.cs file again. 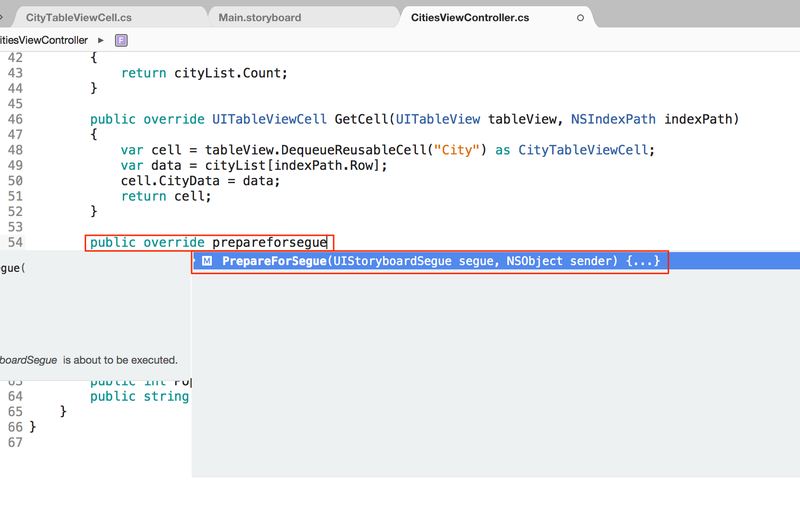 Add the following highlighted line of code to the top section of the existing code. 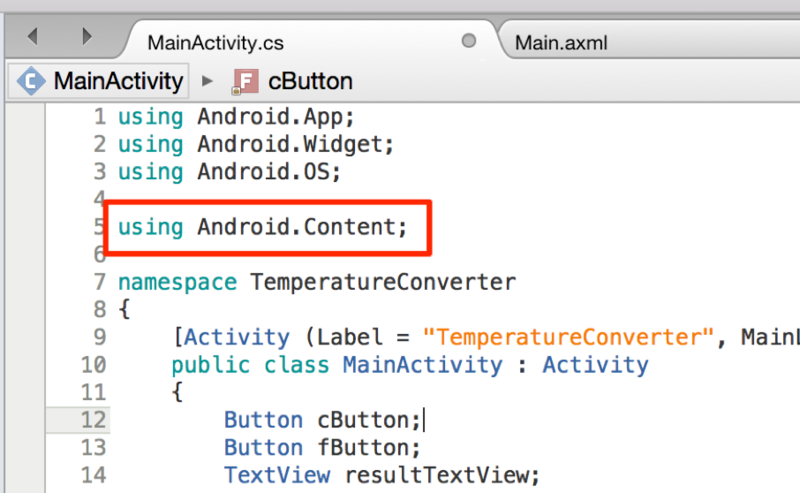 This will give us access to Android.Media. 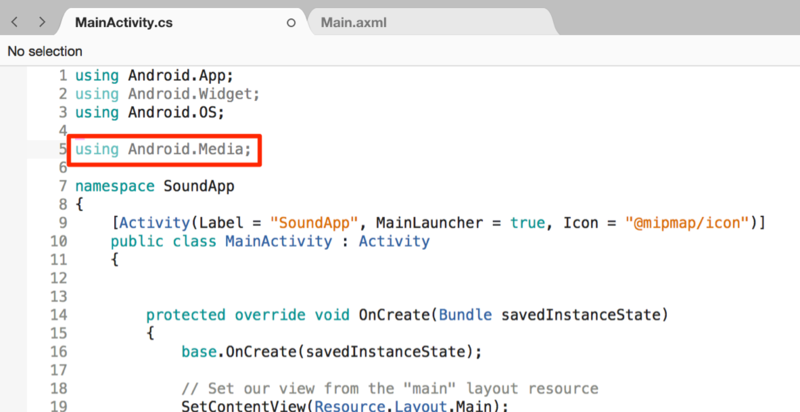 Add the following two highlighted lines of code to the MainActivity.cs file to define the MediaPlayer element and to include the audio file in the code. 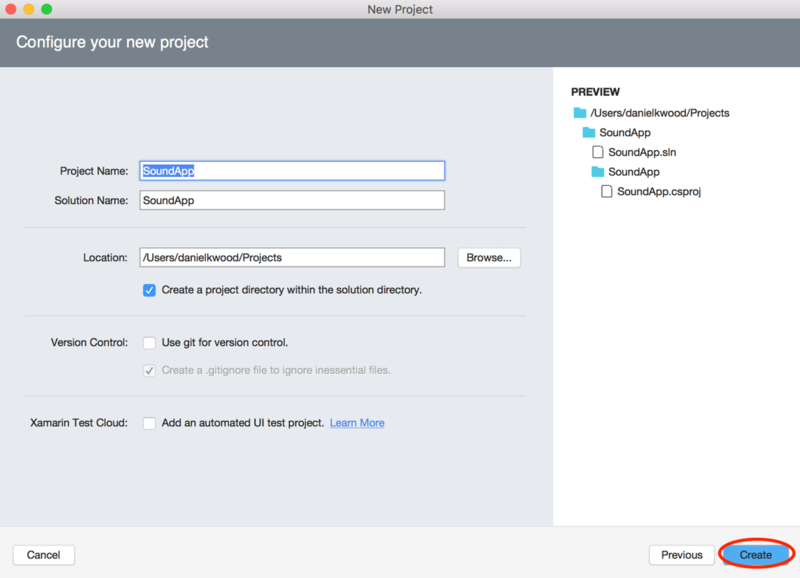 Replace mysound with the name of your audio file (there is no need to include the .mp3 extension). 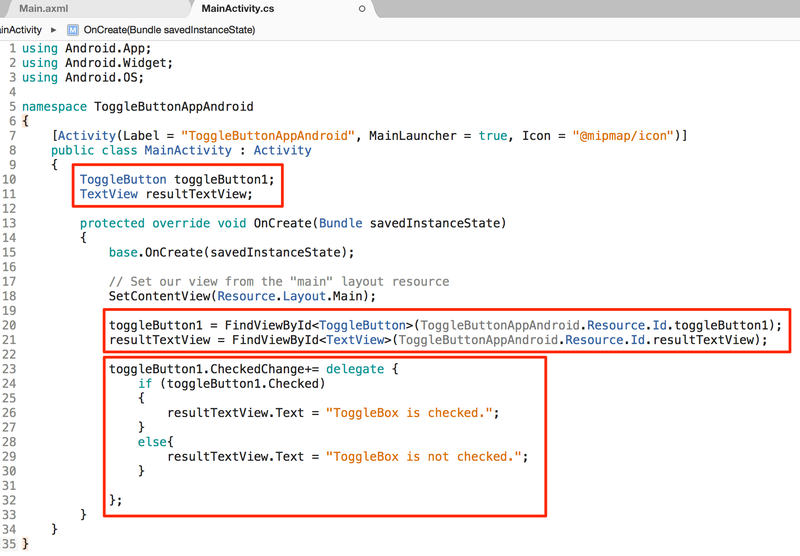 Now add the following two highlighted lines of code to define the Button element and access the playButton button from the screen. 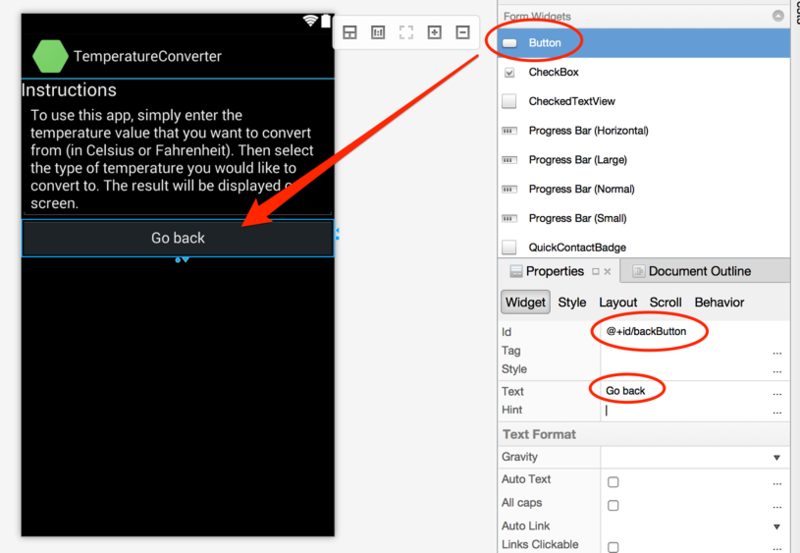 Now add a click event for the button inside the OnCreate method. As you type playButton.Click+= and press the spacebar key you will see a list of options. 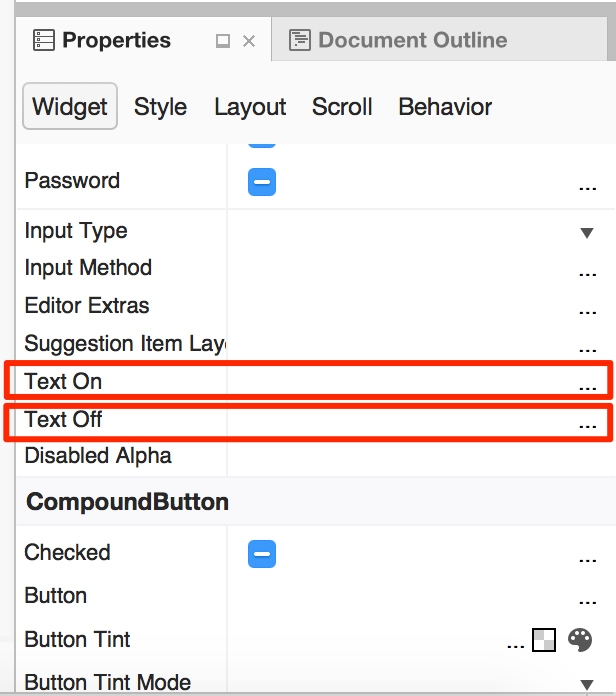 You should see the option to create the PlayButton_Click method (if you don’t, start typing its name until it shows up – as shown below). 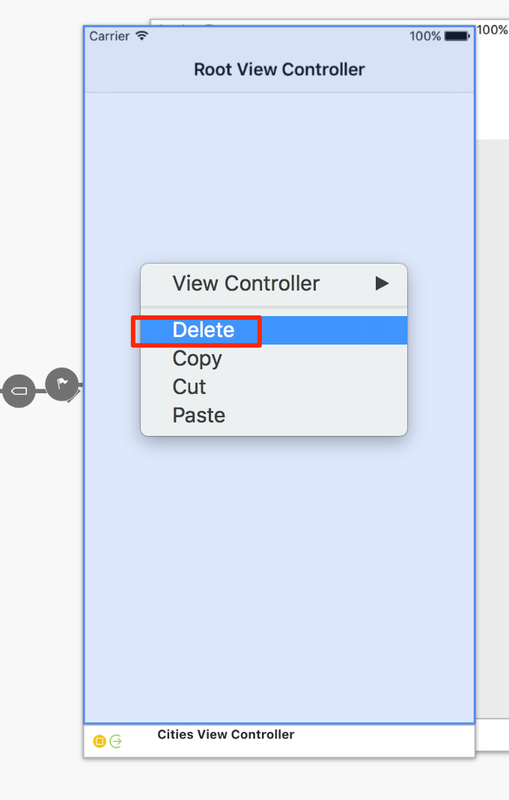 Double-click this option from the list to create a new method. 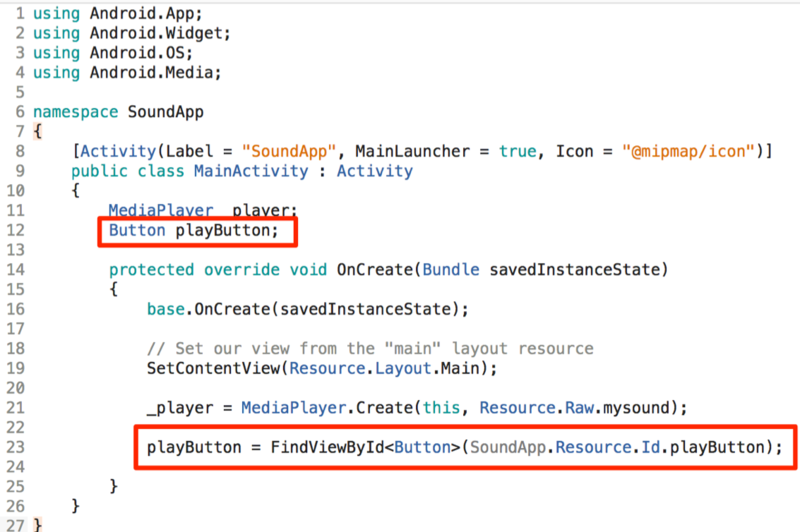 Inside the new PlayButton_Click method add the line _player.Start(); – this will play the sound file when the button is clicked/tapped by the user. 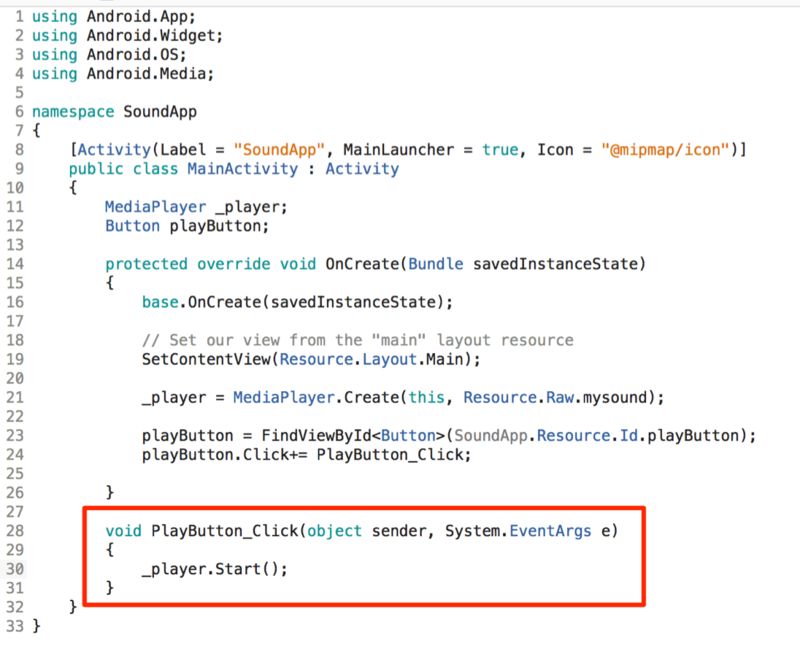 You can use this line anywhere in your app to play the sound (not just on a click event). That’s it! Now go and test your app. Hint: You can also add a button that runs the line of code _player.Stop(); to stop the audio file playing. 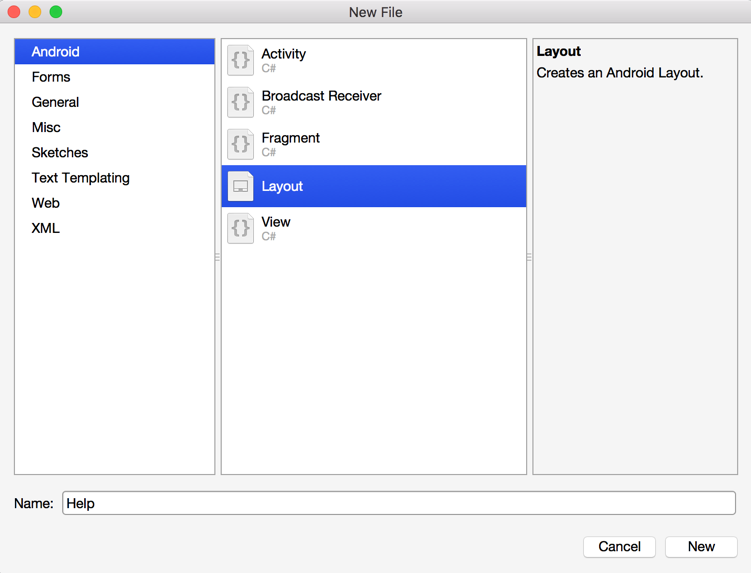 In this tutorial, you will learn how to add multiple screens to an Android app. 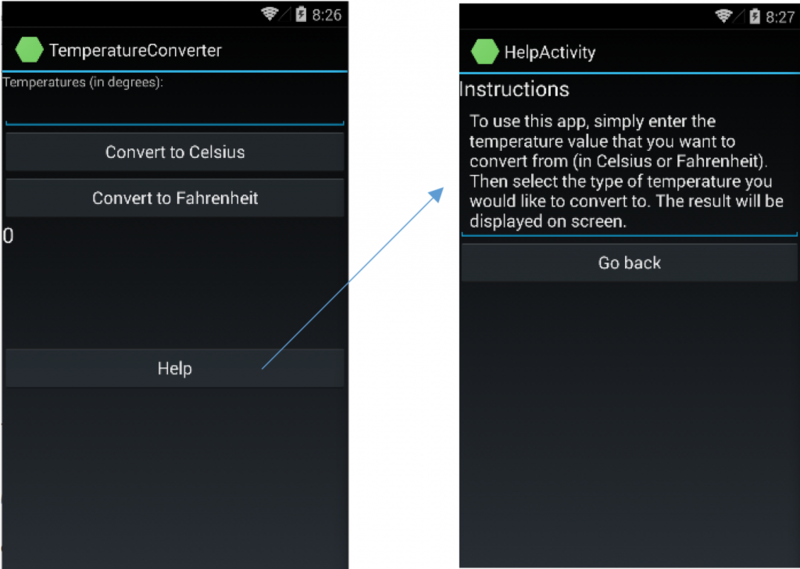 We will use the existing Android Temperature Converter app from one of the earlier tutorials to look at how to add more screens to apps and link each screen with buttons. 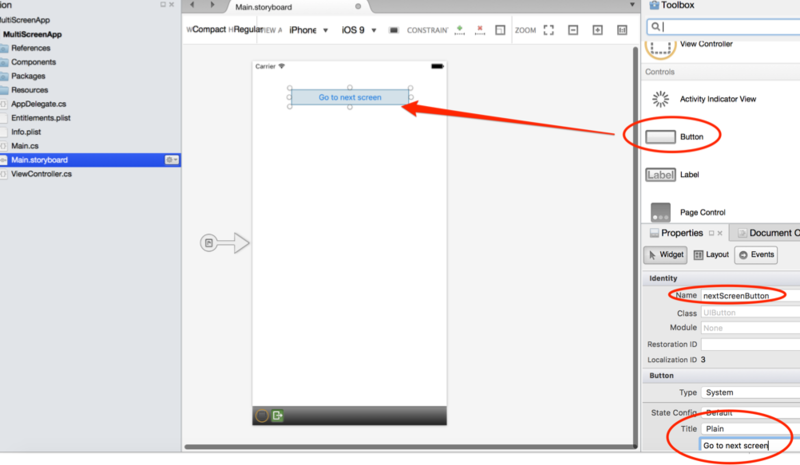 Drag a Space element on to the screen underneath the buttons and text view items. 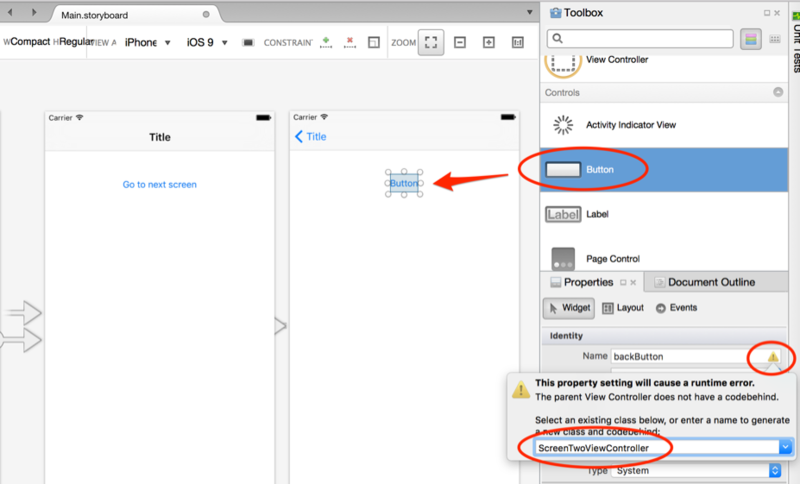 Now go to the Layout tab on the Properties panel and change Height to 100dp. 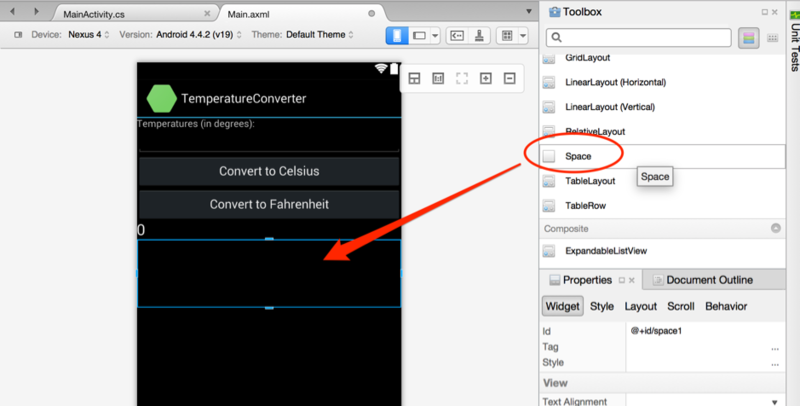 Drag a Button element on to the screen under the Space element. 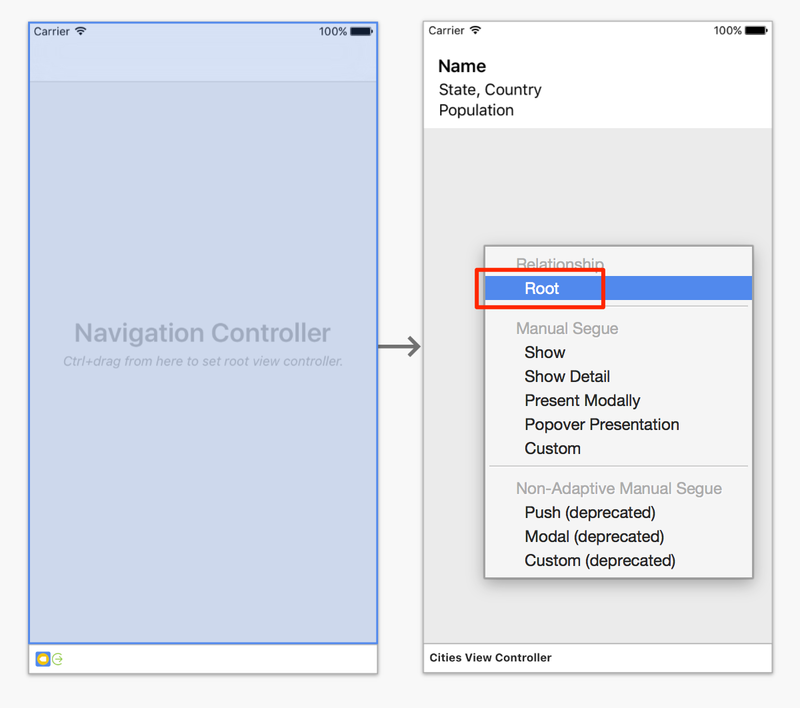 Rename its Id to @+id/helpButton and change the Text value to Help. This button will link to a ‘Help’ screen that will provide information on how to use the app or how to get support. Save the file. 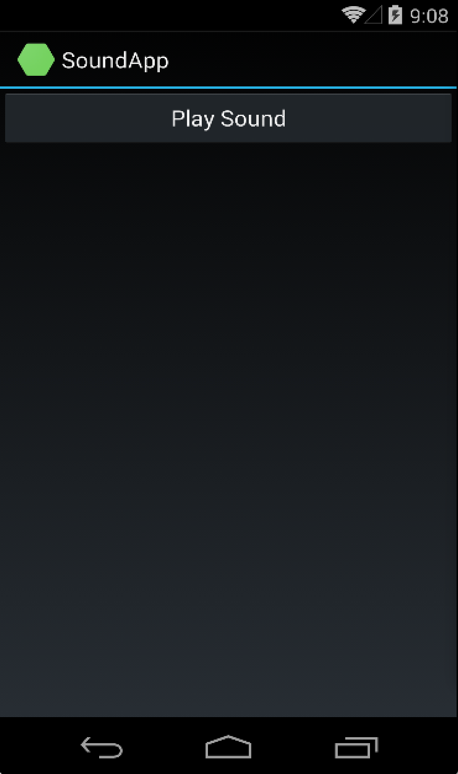 Select a new Android Layout and call it Help. Then click New. Your new Help.axml file should appear in the layout folder. 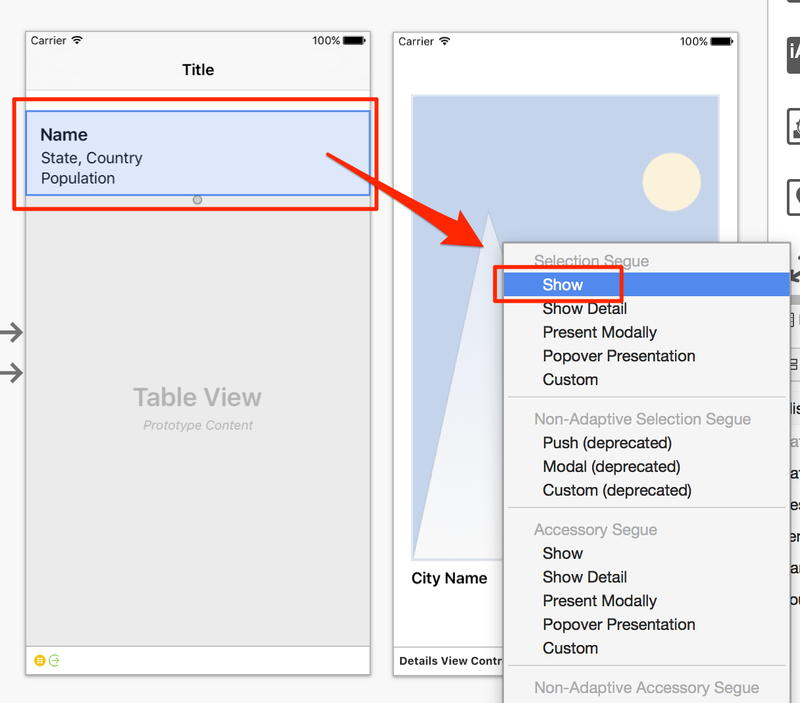 Add a Text (Large) element to the top of the screen and change the Text value to Instructions. 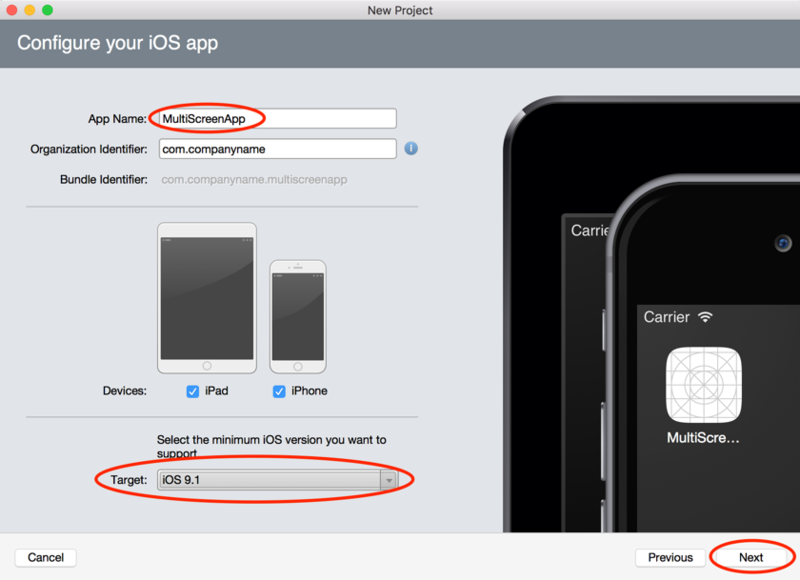 Then add a Multiline Text element to the screen, change its Text value to be the instructions for the app. Now add a Button element. 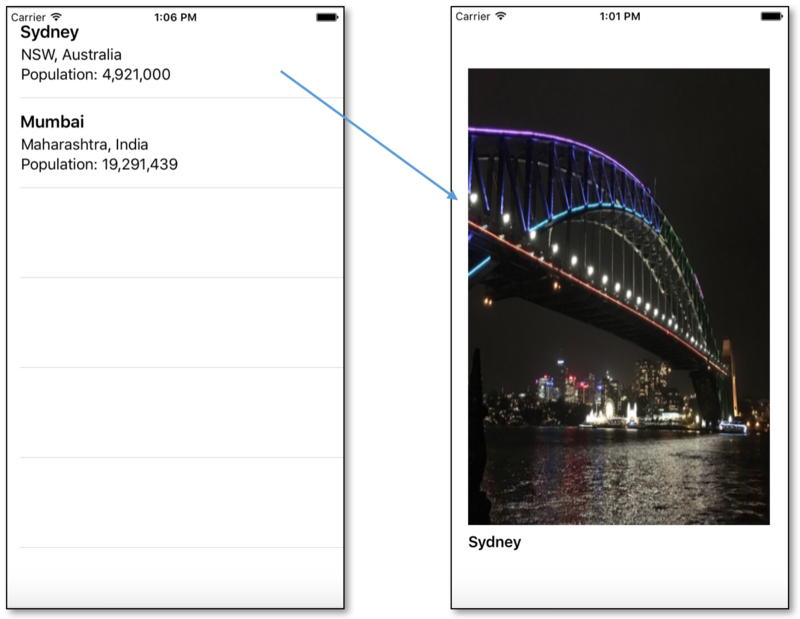 Change its Text value to Go back and its Id to @+id/backButton. Save the file. 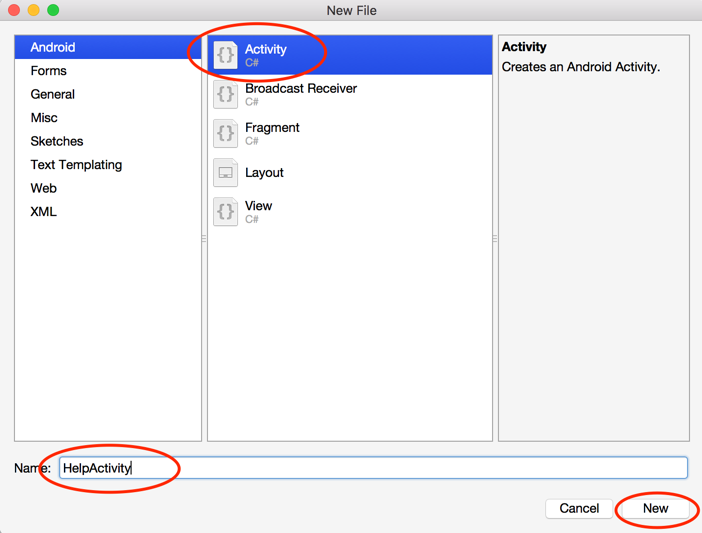 Create a new Activity file called HelpActivity. Click New. This file will contain the code for the Help screen. 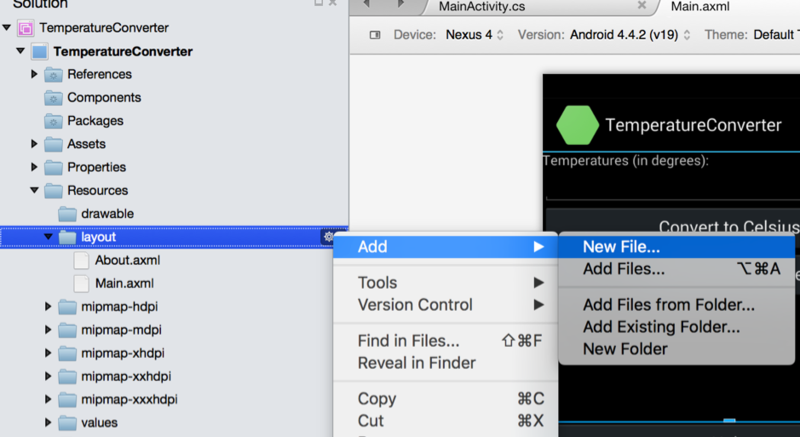 Open the HelpActivity.cs file and add the following line of code to link the Help.axml screen file to the HelpActivity.cs code file. Save the file. 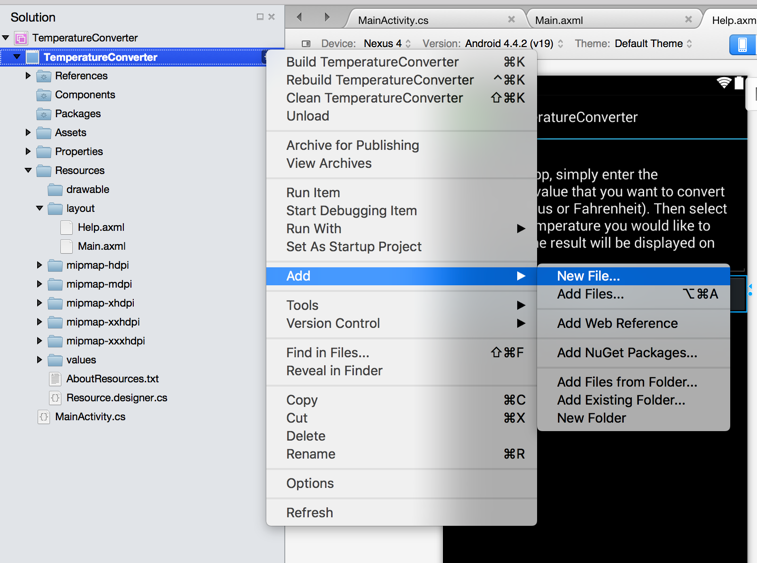 The next thing to do is to go back to the MainActivity.cs file to link the Help button to the Help.axml screen. 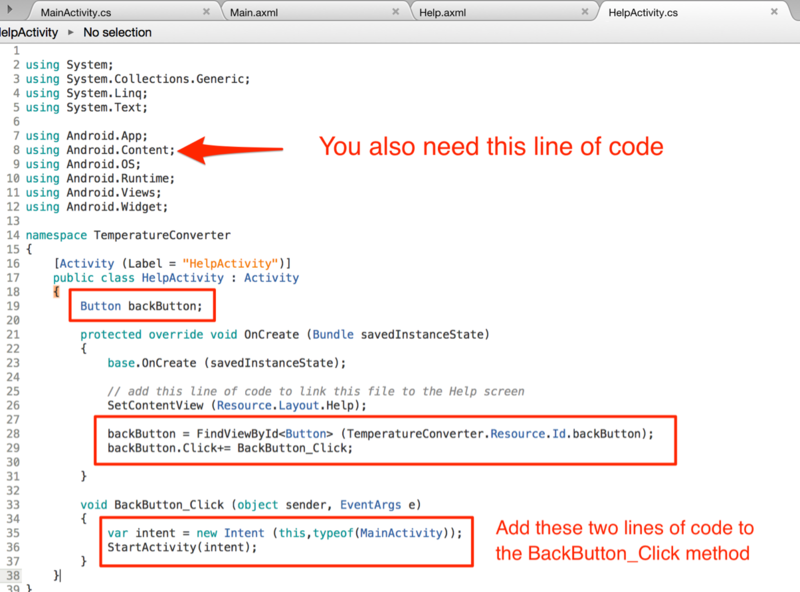 Firstly, define the Help button in the code by adding these lines of code. 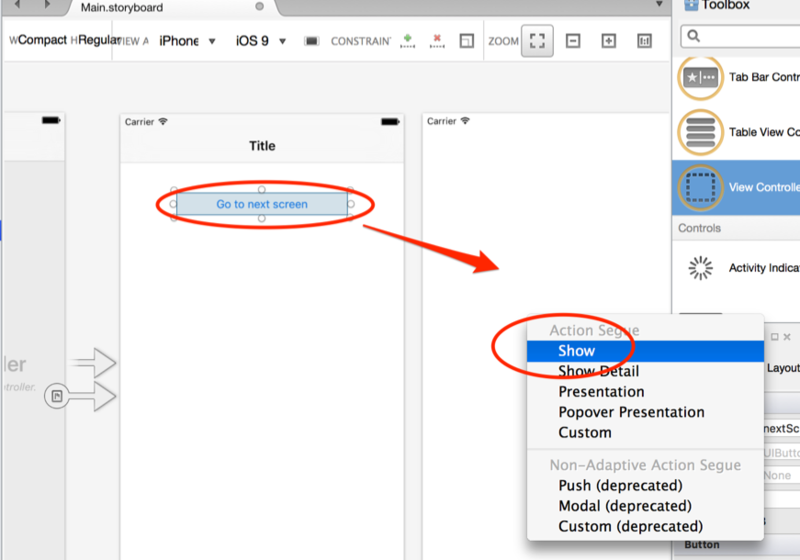 Create a click event for the helpButton Button element. 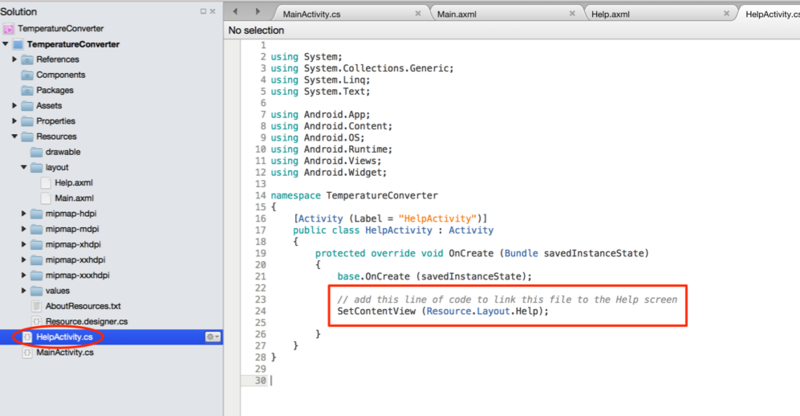 Add the following line of code to the top section of the MainActivity.cs file. 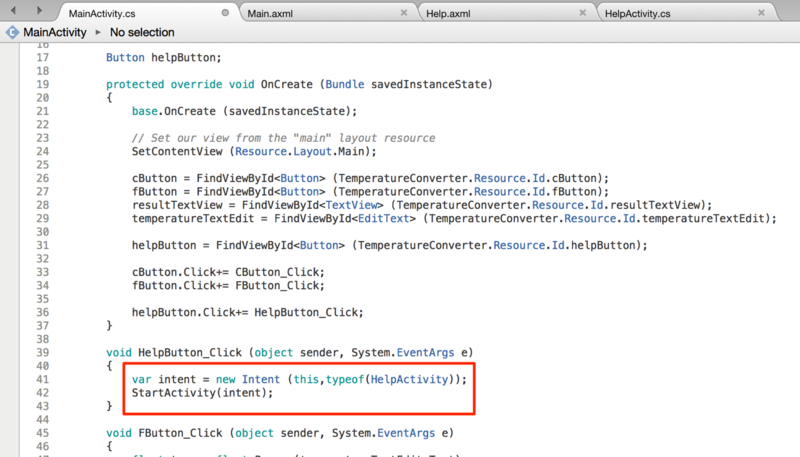 Inside the new HelpButton_Click method, add the following code. 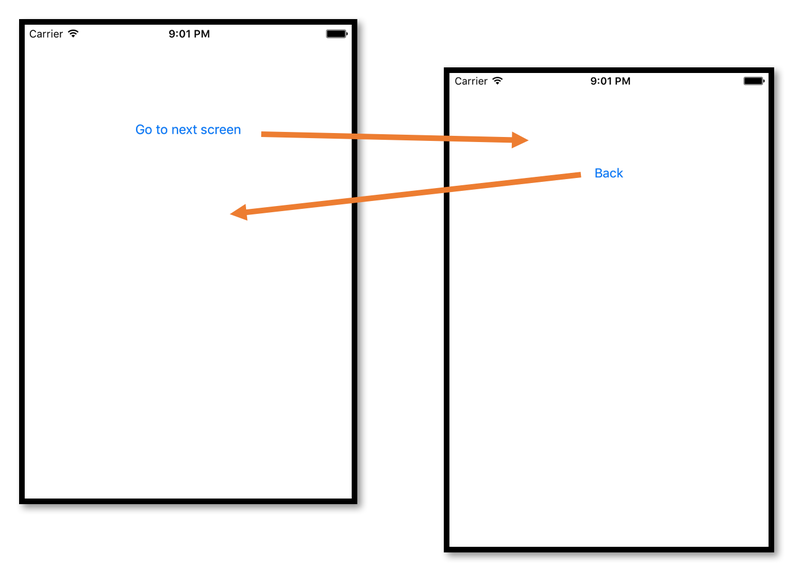 We will create a new intent that will open the other screen (the Help screen) when the button is clicked. Now go back to the HelpActivity.cs file and add this code for the Back home button so that when the user presses that button they will go back to the main screen. Save your files. That’s it! Now go and test your app. It should have two screens like the ones shown below that open when you click on the buttons linking the screens. 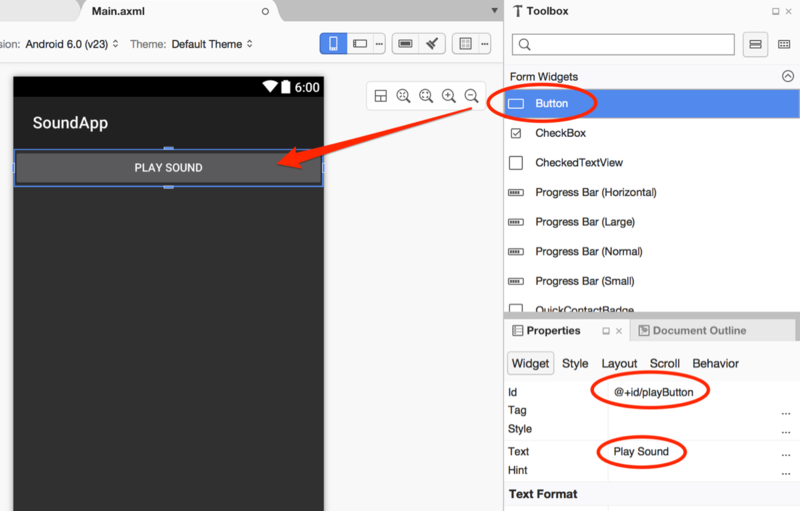 This tutorial explains how to add sound effects and background music to your game in PlayCanvas. You can add sounds that can be heard from anywhere in the game or attach sounds to objects that can only be heard when your character is near them in the game. 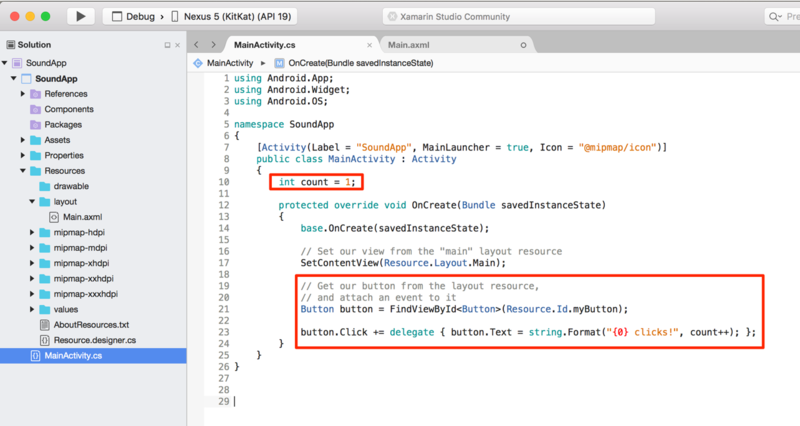 You can also add sounds that automatically play and loop in the background and you can also control when sounds play and stop using code. 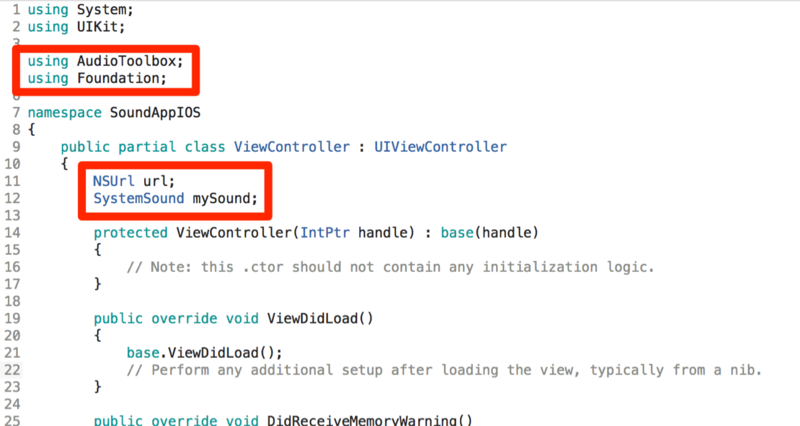 Using code to control sound will be explained in the next tutorial. Watch the video below to see how to add sound to your game. 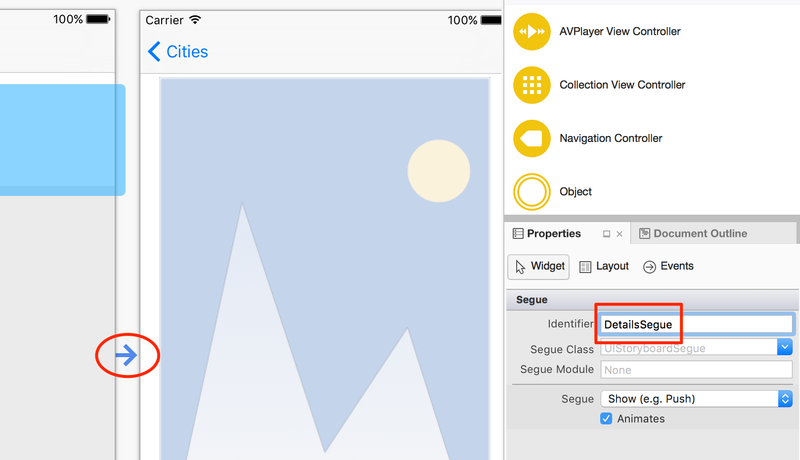 In this tutorial we will look at how to use layers in Unity. 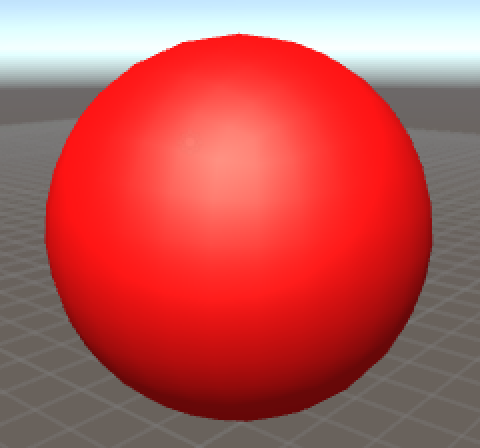 Layers are quite useful if you want to make some objects invisible to different cameras or players or if you want to ignore light or cameras on some layers. Watch the video to see how you can work with layers in Unity. Please note that this tutorial continues on from the previous tutorial: Adding a PIP Map Effect in Unity. 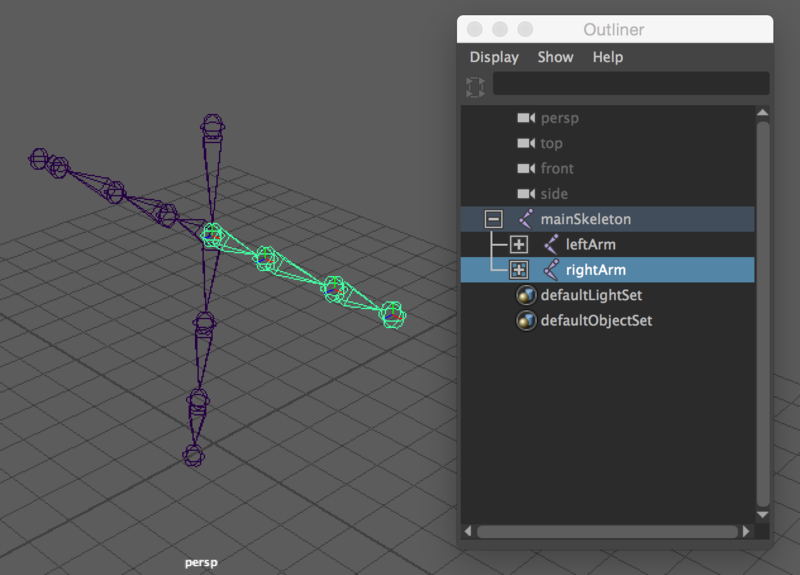 This tutorial explains how to add cameras to your 3D game project in Unity. Cameras allow you to see scenes from different views and you can also attach cameras to the players in your game so that they see different views eg. first person view. Scroll down to watch the video. A camera setup with the Camera Preview in Unity. 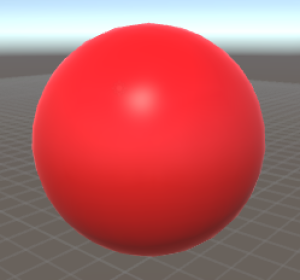 Watch the video below to see how you can add cameras to your own game project. 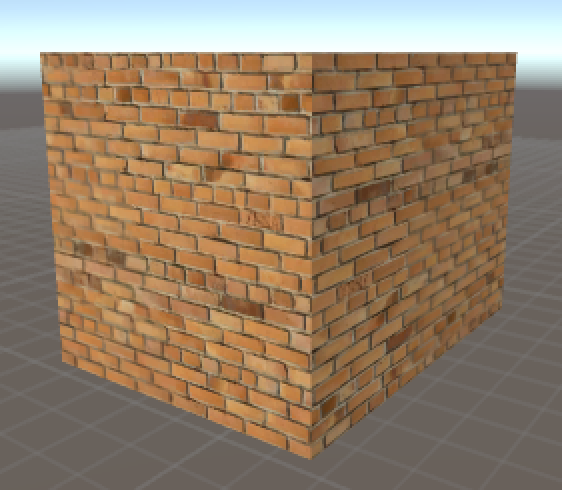 This tutorial explains how to add terrain to your 3D game environment in Unity. You will also learn how to edit the terrain and add textures to it, as well as how to add trees, shrubs, grass and water to the terrain. To add textures, trees, grass and water to your terrain, you will need to import assets into your Unity project – this is also covered in the video. Scroll down the page to watch the video. After watching this video, you will see just how easy it is to add terrain to your game environment like in the examples above. If you find that Unity is running very slow, then reduce the amount of trees and grass in the environment. Lots of grass and trees can make Unity run slower. Note that the environment will not be fully rendered in Scene or Game view so the quality will not appear as high as it will be in the fully rendered game. The image below shows how grass is rendered in front of a player in first person view. Grass rendered in first person view.